Chrome vanadium/carbon steel chrome plated Matt, satin or polish finish. Availability : chrome plated packing: as per order (any type). Plated Matt, Satin or Polish Finish. 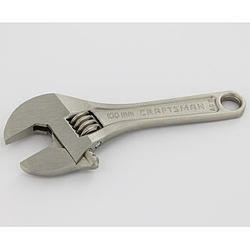 AP061AU-WIndentation Socket Angle Type; Non Shut Off Wrench4Square drive: 3/8" 4Bolt capacity: M11-M13 mm 4Free Speed 5;500 r.p.m 4Length: 276 mm4Weight: 1.5 kg 4Average Air Consumption: 430 L/min4Torque Range (Hard Joint. Rotary Measure)5~6 bar: 20~35 Nm / 14.8~25.8 ft-lbs. Being the well-distinguished companies in the market, we are into offering Cordless Angle Wrench.